If you’re trying to save energy, an energy saving washer is a great way to make a dent in your energy bills, and your carbon footprint if that’s something you want to address. If you’re like most people the easy route is just to buy the most efficient clothes washer you can afford. But if you want to really have an impact, changing some habits might make as much of a difference as buying a new energy saving clothes washer. You can make your current washer an energy saving washer, and save lots of money and energy, just by changing your habits! Is hot water really essential for washing clothes? Doing laundry uses energy – and costs you money – in four ways. First, it takes energy to heat the water for your laundry if you wash in hot or warm water. Second, it takes energy to dry your laundry if you dry your laundry in a clothes dryer. Third, it takes electrical energy to rotate the washer or dryer drum, agitate the washer drum (if a top-loader), pump water, drain water, and blow air. Fourth, it takes energy to manufacture the detergent, which is often heavily based on fossil fuels. So as oil prices and other fossil fuel prices inevitably rise, expect your detergent to get more expensive. Cutting on this is a great way to save money and cut your indirect energy use. One feature of a typical energy saving washer – a front-loader – is that it uses much less detergent than a standard top loader. The detergent shown at right is for HE or high efficiency front loading washers, and like many other ‘green labeled’ detergents, is produced without petrochemicals. Although it’s a stiff price to pay up front – around $63 – you’re getting 160 loads x 4 boxes, which works out to less than ten cents a load! It turns out that the biggest cost for washing machines is heating the water. So if you really want to cut your energy costs for laundry, cut out the hot water. I’ve been washing my family’s clothes entirely in cold water for years. The result? Clean laundry, of course. And lower natural gas bills. ENERGY STAR hot water heater: If you must use hot water in your laundry, it may be time to replace your existing hot water heater with an ENERGY STAR water heater, as these new hot water heaters are much more efficient than the old electric or gas tanks. Proper size loads: Most upright washers use the same amount of water regardless of the load size. So make sure you only wash full loads whenever possible. If your clothes washer does allow you to select a water level, choose the level appropriate to the load. Less hot water in the washer means less energy. If you already have a front-loading energy saving washer, you don’t need to worry about proper size loads as much – a front loading energy saving washer automatically senses how much laundry is there, and uses the appropriate amount of water. Be careful not to overload your washer. I once crammed as much laundry as possible into my mom’s washer, thinking that would save on hot water. It broke the agitator motor and it cost hundreds to get the washer fixed. Penny wise and pound foolish! Even if you don’t break a washer by overloading it, you can cause increased wear, and chances are the laundry won’t come out that clean. Presoak: If you think hot water is the only way to remove the worst stains, try using an environmentally friendly stain remover, presoaking in plain water, soapy water, water and vinegar, or water and hydrogen peroxide. There’s not much point in washing an entire load in hot water when all you’re trying to do is get a blackberry stain out of your six-year-old’s t-shirt. Alternate hot and cold washes by week: If stains or heavy dirt are a concern, you can still wash with hot water every other load that you would normally wash in hot. On the cold loads you may not get every bit of dirt out, but the next time round when they go in the hot water, you will. You can also try warm instead of hot washes and see how well that works for you. 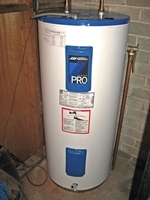 Turn your hot water tank down: You don’t have to keep your hot water heater at the factory default 60C or 140F. Turn it down a notch. Even if you keep washing in hot water you’ll still save quite a bit on your hot water costs. Avoid warm rinses: Many washers, even energy saving washers, have a warm rinse option. There’s really no reason to use this. A cold rinse actually works better than a warm one and saves energy too. Put your washer where your water is: If you can place your clothes washer close to your hot water heater you’ll save on heat loss through the hot water pipes. You should also try to wrap your hot water pipes (any in your house, not just those to your clothes washer) in insulating pipe wrap such as Armaflex insulation. Clean only when necessary. There’s no law requiring clothes to be washed after each use. And make sure your kids follow this rule as well. Kids usually prefer to throw their clothes in the laundry, rather than fold them and put them away. Even grown-ups do this – we defer the effort of folding and putting away until after we’ve done the laundry. But when you toss that shirt into the laundry basket instead of hanging it back up, you’re not saving work, you’re making more work. Not only will you still have to hang the shirt up, but you’ll have to haul it to the clothes washer, move it to the dryer or the clothesline, possibly iron it, and you’ll still have to hang it up when it’s clean. How often do the clothes you wear really need to be washed? Does it look dirty? Does it smell bad? If it looks clean and still smells clean, what’s the point in washing it? By simply putting laundry away again when it’s not dirty, instead of washing it after each use, not only will you cut down the number of loads of laundry you have to do (your effort) and the energy required to do them (heating and mechanical energy), you’ll also extend the life of your wardrobe, which means less money spent replacing worn-out clothes. As I said, for socks and underwear we usually put them in the laundry after one use. But you can make an exception even there: if you wear a pair of socks or underwear only for a short period, save them for the next day. For example, suppose you go jogging or bicycling at 7pm. You get all sweaty, and when you get back at 8pm you shower. No way are you putting those sweaty socks or underwear back on – so you change into clean underwear. But if you’re going to bed at 10pm, do the socks and underwear you put on at 8pm need to be cleaned? Maybe not. Save them for tomorrow. Are washers really time-saving devices? Here’s an interesting thing about automatic clothes washers. You might think that they save us time. But if you look at the amount of time housewives (sorry – that’s who always did it in the old days) spent on washing clothes before there were motorized clothes washers, many of them actually spent less time on laundry before they had an automatic washer than after they got one. Why? Because the easier it is to do laundry, the more tempting it is to do more. Just read a novel like William Faulkner’s Light in August and you’ll understand what I’m talking about. One of the main characters, if memory serves me, washes his one shirt once a week, and goes bare-shirted while the shirt dries. While I’m not advocating this level of simplicity for the modern household, it’s helpful to think of how far to the other extreme we’ve gone when we wash a load of laundry every day! By the same token, don’t fall into the trap – after you buy an energy saving washer – of washing more clothes just because you think it will use less energy. The best alternative is (A) cut the number of loads you do and the amount of hot water you use, then (B) buy an energy saving washer and continue with your reduced loads and hot water use. Otherwise the excess loads you do with your energy saving washer will undo the good of both the new washer and the new energy saving habits. So save yourself not just energy but time – only wash what really needs to be washed! with an energy saving washer! If you’re thinking of buying a new energy saving washer, don’t just think about the amount of hot water you’ll save. Think about the impact of your energy saving washer choice on drying your clothes. The better a job your new washer does of extracting water from your laundry during the spin cycle, the less energy you’ll use on drying. You can see my separate article on energy efficient dryers for more information on how to save energy on clothes drying. The bottom line? 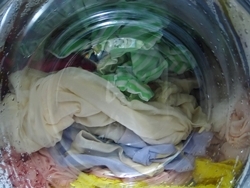 An energy saving washer is one that spins your clothes virtually dry before they come out of the washer drum! I’m always amazed, when I open my washer after the spin cycle, how dry some of the clothes feel. Fleece sweaters, for instance, are so dry you can practically put them on right away, and feel warm! The amount of electricity a washer uses for mechanical purposes (agitation, spinning, pumping) is negligible compared to the amount of energy used to heat the hot water (if you wash in hot), or to dry your clothes (if you use a clothes dryer instead of using solar energy to line dry). But you’ll still see vast variances in kWh consumption for different dryers – at least in the EnerGuide rating systems used in Canada – because the EnerGuide estimate of kWh factors in both the electrical energy required to run the washer, and the heating energy required to (A) heat the hot water when used, and (B) heat the air used to dry the laundry in a standard washer after the dry cycle. The portion of the energy that represents (B) is actually a way to rate how efficient the spin cycle on the washer is. 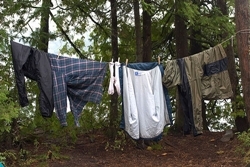 The Canadian EnerGuide ratings are based on 392 normal cycle operations per year (yikes, someone’s doing way too much laundry), and the ratings range from 100 to 500 kWh per year, which means the total energy consumed per load – mechanical plus water heating plus energy required to extract water in the drying cycle – is between 0.26 and 1.3 kWh per load. So realistically, even the least energy saving dryer is only using around $0.10 – $0.13 per load (at $.10 per kWh) of mechanical, and if you’re like my family and you only do 2-3 loads a week, that only adds up to at most $20 and change per year in mechanical energy. The amount of hot water left after the spin cycle. Front-loading washers have lower water requirements (because the tumbling action of both water and clothes is what does the washing, and less water is needed than in a full top-loading, agitator-stirred washer). They also have faster spin cycles (if you’ve ever heard a top-loader squealing from an unbalanced barrel during the spin cycle, you’ll understand why). So they both use less hot water, and extract more water during the spin cycle, than top-loaders. So a front-loader is your best bet for an energy saving washer. You can do significantly better than the EnerGuide ratings, or the equivalent US ratings, for whatever energy saving washer you buy, if you (A) wash fewer loads overall, (B) wash a lesser percentage of your loads in hot or warm water, and (C) use any free energy you can for drying (see my energy efficient dryers article for more on that). If space is an issue for you, as it was for me in my 4×7 foot basement bathroom, then a front-loading washer is both a more energy saving washer and a more compact one. Because the washer does not load from the top but from the front, you can easily stack a compatible dryer on top of it, using one appliance’s floor space for two appliances. And if you want an all-in-one unit – a washer/dryer combo in a single appliance – they are suitable for one or two people living in a small space (a bachelor or one bedroom apartment for example). They are hard to come by but if you want your entire laundry system to fit under a narrow width of kitchen cabinet, for example, or you want the convenience of being able to start a load of wash, and come home to clean, dry clothes, a washer/dryer combo may be your ticket. These units are more expensive than a typical washer or dryer – of course – they are both units combined into one – but very compact, and some have ENERGY STAR ratings. The drawbacks? First of all, the drying cycle typically works on a different principle than a traditional heat-based dryer: rather than use heat to evaporate the water from the clothes, washer/dryer combos use condensation! This means they actually use a small amount of water from your tap to create the condensation that draws the water out of your clothes – so your water use will go up slightly. As well, many users report that the dry cycle – even the extra-dry setting – doesn’t dry clothes as well as a traditional dryer. It also tends to wrinkle them more. As well, these units have a tendency to vibrate a lot during the spin cycle. And increased vibration means more loosening of parts, which may explain why these units tend to fail earlier on average than traditional washers or dryers. Or the earlier failures could be the result of trying to pack twice as many features into one machine – but owners of these machines are divided between those who rave about it (usually people who have bought one recently) and those who have paid the price in the form of extra repair bills, or irreparable machines. The moral here: if you buy a washer/dryer combo, play it safe: get the extended warranty. And make sure there is someone in your town or city who knows how to service them, or you’ll wait forever to get service. For more on how combination units can save you money, space, energy or all three, see washer dryer combos at Washing-Machine-Wizard.com. I fussed for a long time over which front-loading washer to buy a few years back. My wife and I went from store to store looking at the Kenmore models at Sears, as well as the Frigidaire, Whirlpool, and countless other models. It didn’t take us long to notice that many of the brands had models that looked remarkably similar – but never had the exact same set of features. Why was there this dazzling array of different feature combinations on washers that all looked like they came from at most two different factories? Because they all came from at most two different factories! It turns out, as one extremely unconventional and honest salesperson told us, that there are just a small number of factories where most of these energy saving washers are made – mostly in China – and the North American brands simply order different combinations of features from a standard list, when they spec out their washer product lines. And they are all careful not to choose the exact list of features that other manufacturers choose – so that it’s impossible for you to compare two washers from different manufacturers and know which one is better. The way to handle this feature overload – which is common across most mechanical and electronic consumer products – is to not start shopping until you’ve made a list of the features you need, and when you go shopping, completely ignore any features you don’t need. For instance, I have no use for a hot wash – I’ve never used it. And I have no use for the buzzer that sounds when the wash is done – it just wakes me up. On the other hand, a delayed start feature might be handy if you want the clothes to be just finishing their spin cycle when you wake up – so you can toss them in the dryer before they’ve sat around too long. So make your own required feature list, and as you shop for an energy saving washer, look only at those features that matter to you. Include, of course, energy efficiency and ENERGY STAR ratings as criteria. All the other features you didn’t originally think of are likely to be fluff that doesn’t matter and shouldn’t affect your purchase decision or the value – to you – of the energy saving washer you are going to buy. The authoritative sites, for the US and Canada, to find the best energy saving washer, are the ENERGY STAR website in the US, which only lists ENERGY STAR-qualified appliances, and the Office of Energy Efficiency (OEE – CA), which lists all washers and indicates which ones are ENERGY STAR-qualified. Check out their websites for a list of the most energy saving washers. Don’t buy a washer that isn’t ENERGY STAR-qualified! The websites are given first for the general address and second for the list of washers – in case the washer list link changes, the main website links are less likely to do so. Energy saving washer list: oee.nrcan.gc.ca/pml-lmp/index.cfm?action=app.search-recherche&appliance=CLOTHESWASHERS. Note that as of December 2013 the OEE website appears to be in transition to a new design and these links may not continue working much longer. If they don’t work for you, please (A) contact us to let us know, and (B) just go to www.nrcan.gc.ca and look for “Office of Energy Efficiency < Energy Efficiency Ratings”. To use these table top washers you just add a small amount of laundry, add water to the fill line, drop in a tiny bit of detergent, seal the unit up, and agitate it by hand. While I haven’t used one myself people who have used them give them rave reviews for ease of use and for the cost savings they provide. They just won’t stand up to major laundry jobs like washing your jeans collection! Once your clothes are washed in a table top washer you can use a mini-spin-dryer, also available for $100-200, to wring almost all the water out of the laundry so that it can line dry indoors in a matter of a couple of hours. Again, a great option for people living on their own in an apartment and wanting to save money. A high-speed centrifugal spinner will extract much more water than the spin cycle in a traditional top loading washer, and the more water you expel using the spin cycle, the less soapy residue remains in the clothes. This residue gets dried onto the fabric (unlike water, it doesn’t evaporate) so a high speed spin cycle not only saves on drying time but leaves your clothes more natural and soap-free.